In inflammatory bowel disease (IBD), repeated bouts of remission and relapse occur in patients and can impose a risk of colitis-associated cancer. We hypothesized that plant extracts of Atractylodes macrocephala (AM) or Taraxacum herba (TH) may be better than sulfasalazine for treating this disease because these extracts can promote additional regeneration. Murine intestinal epithelial IEC-6 cells were pretreated with AM or TH before a lipopolysaccharide (LPS)-induced challenge. Acute colitis was induced with 7 days of dextran sulfate sodium (DSS) in male C57BL/6 mice, and extracts of AM and TH were administered for 2 weeks before DSS administration. In vitro studies demonstrated that AM or TH treatment reduced LPS-induced COX-2 and tumor necrosis factor-α mRNA levels but increased heme oxygenase-1 (HO-1). 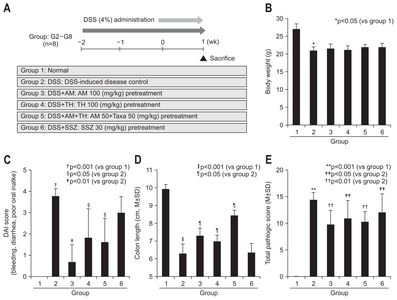 Oral preadministration of AM and TH rescued mice from DSS-induced colitis by inhibiting inflammatory mediators via inactivated extracellular signal regulated kinase and repressed nuclear factor κB and signal transducer and activator of transcription 3, but the effect was weaker for sulfasalazine than that for the extracts. Anti-inflammatory activities occurred via the inhibition of macrophage and T lymphocyte infiltrations. Unlike sulfasalazine, which did not induce HO-1, TH extracts afforded significant HO-1 induction. Because the AM or TH extracts were far superior in preventing DSS-induced colitis than sulfasalazine, AM or TH extracts can be considered natural agents that can prevent IBD relapse. Recently concerns regarding phytochemicals, naturally organized substance from root, stem and leaves of plants, had been raised remarkably even in the era of modern medicine like biologics, the reason why preference for natural products even in the developmental stage of molecular targeted therapy can be explained by their orchestrated actions such as anti-inflammation and immune modulation including reducing cytokine secretion and regulating redox-sensitive transcription factors, antioxidative and regenerative action as well as antimutagenesis. In summary, beside of well-known safety, even though biologics or immune modulators covers specific merit under top-down approach achieving mucosal healing and complete healing, phytochemicals from natural products can also impose well-concerted actions of “anti-inflammation” and “regeneration,” being implicated in preventing relapse as well as removing oncogenic inflammatory activities. Though current drug therapies including 5-aminosalicylates (5-ASA) and some immune modulators have been prescribed commonly, they have shown unexpected diverse side effects as well as some limitation in efficacy. Therefore, continuous efforts had been paid to find naturally occurring phytochemicals such as polyphenols, terpenoids, and flavonoids as alternative candidates for inflammatory bowel disease (IBD) therapy. Furthermore, unmet clinical need in the treatment of IBD is that one of clinical features of IBD is frequent relapse even during maintenance therapy and these repeated bouts of relapse threatened patient the fear of cancer complication. Though not so high, the risk of colitis-associated cancer (CAC) still demands the development of safer and effective anti-inflammatory agents. We hypothesized that possibly “natural agent” or “phytochemicals” can be answer to this unmet medical need. Until now, several anti-inflammatory and antioxidant effects of AM or TH were explored in diverse disease models, but never evaluated for IBD. Considering the clinical features of IBD, vulnerable to relapse relevant to sustained inflammatory surge in spite of maintenance therapy, in this study, we aimed at documenting the anti-inflammatory and antioxidant activities of AM and/or TH on experimentally induced colitis, pretreatment in order to put the clinical implication of preventing relapse. All chemical reagents were obtained from Sigma (St. Louis, MO, USA). AM and TH phytochemicals were supplied from NeuMed Inc. (Seoul, Korea), dissolved in dimethyl sulfoxide (DMSO) for experiment. Dextran sulfate sodium salt (DSS; molecular weight at 36,000 to 50,000 Da) was purchased from MP Biomedicals (Morgan Irvine, CA, USA). Primary antibodies for Western blotting were purchased as follows: α-tubulin, β-actin, and NQO-1 from Santa Cruz Biotechnology (Santa Cruz, CA, USA); COX-2 antibody was from Thermo Scientific (Fremont, CA, USA), other antibodies from Cell Signaling Technology (Danvers, MA, USA). Horseradish peroxidase-conjugated anti-rat/rabbit/mouse/goat IgG was purchased Santa Cruz Biotechnology. All other materials were obtained in the highest available grade. The dried aerial part of TH and rhizomes of AM were purchased from Gyeongdong Herbal Market, Jegi-dong Seoul, Korea. The samples were identified by professor Hocheol Kim and voucher specimens (#HP565 and #HP019) were deposited at the Department of Herbal Pharmacology, College of Oriental Medicine, Kyung Hee University, Seoul, Korea. Dried aerial part of 50 g TH and root of 50 g AM were extracted separately with water by using a reflux apparatus twice for 3 hours at 100°C. The extracts were filtered and concentrated under reduced pressure, and samples were lyophilized to yield a yellow brown powder. The yield (%) of individual extracts was 24.4% and 68.5%, respectively. Then, two kinds of powder were mixed for preparing HT057 in the proportion of the powder. The quantitative authentication of HP565, HP019 and HT057 performed by a high performance liquid chromatography (HPLC) analysis system equipped with a Waters 1525 pump, a 2707 Autosampler and a 2998 PDA detector (See Supplementary Fig. 1A). The chromatic separation was achieved at 40°C on Waters Sunfire™ C18 column (250 mm×4.6 mm i.d., 5 μm particle size). The mobile phase consisted of 0.5% phosphoric acid Aàsolvent A, Bàsolvent B eluted at 1.0 mL/min with the following program for separation: 0 to 20 minutes, 10% to 20%; 20–25 minutes, 20% to 20%; 25–35 minutes, 20% to 25%; 35–40 minutes, 25% to 35%; 40–45 minutes, 35% to 35%; 45–50 minutes, 35% to 65%; 50–60 minutes, 65% to 65%; 60–65 minutes, 65% to 80%; 65–67 minutes, 80% to 10% solvent B. A 10 μL aliquot of the extract solution was injected into the HPLC system. Quantitative analysis was replicated three times. Samples were monitored at 220 nm for atractylenolide III and 348 nm for luteolin-7-O-glucoside. The high-performance liquid chromatogram of HT057 and the structures of the constituent compound are shown in Supplementary Fig. 1. The compounds, Atractylenolide III for AM and luteolin-7-O-glucoside for TH, had contents of 51.2 μg/g and 83.0 μg/g, respectively. Also, the atractylenolide III and luteolin-7-O-glucoside had contents of 84.3 μg/g and 169.6 μg/g in HP019 and HP565. Six-week-old female C57BL/6 mice (Orient Bio Inc., Seongnam, Korea) were fed sterilized commercial pellet diets (Biogenomics Co., Seoul, Korea) and sterilized water ad libitum and housed in an air conditioned biohazard room at a temperature of 24°C. One group composed of eight mice. Control mice were treated with vehicle only as group 1. Group 2 was administered with 4% DSS in drinking water as in disease control group. Group 3 was administered with additional daily oral gavage of AM 100 mg/kg in 100 μL volume and TH 100 mg/kg as group 4, AM 50 mg/kg+TH 50 mg/kg as group 5, and sulfasalazine 30 mg/kg as group 6. AM and TH were given orally for 14 days. After 2 weeks of treatment with either vehicle or AM and TH, animals were given 4% DSS in drinking water, except those of the control group, for 7 days with or without AM and TH treatment. Animals were handled in an accredited animal facility in accordance with Animal Care Policies and Center for Animal Care and Utilization (CHA University CHA Bio Complex, Seongnam, Korea). Total RNA was isolated with TRIzol (Life Technologies, Carlsbad, CA, USA). The tissues in TRIzol were incubated for 10 minutes at 4°C. Furthermore, 100 μL of chloroform was added and gently mixed. After incubation for 10 minutes on ice, samples were centrifuged at 12,000 rpm for 15 minutes. Supernatants were mixed with 500 μL of isopropanol and incubated at 4°C for 15 minutes. After centrifuging at 12,000 rpm for 10 minutes, pellets were washed with 70% (v/v) ethanol. After allowing the ethanol to completely evaporate, pellets were dissolved in 100 μL of diethylenepyrocarbonate-treated water (Invitrogen Life Technologies, Carlsbad, CA, USA). Complementary DNA was prepared using reverse transcriptase originating from Murine Moloney leukemia virus (Promega, Madison, WI, USA), according to the manufacturer’s instructions. Polymerase chain reaction was performed for 35 cycles at 94°C for 30 seconds, 58°C for 30 seconds, and 72°C for 30 seconds. Oligonucleotide primers were Table 1. The tissues were homogenized with ice-cold cell lysis buffer (Cell Signaling Technology) containing 1 mM phenylmethylsulfonyl fluoride. After 1 hour of incubation, samples were centrifuged at 12,000 rpm for 15 minutes. Supernatants were then collected. Proteins were separated by sodium dodecyl sulfate polyacrylamide gel electrophoresis and transferred to polyvinylidene fluoride membranes, which were incubated with appropriate antibodies and visualized using an enhanced chemiluminescence system (GE Healthcare, Buckinghamshire, UK). Following harvesting of the colon, and homogenized in 10 mM sodium phosphate buffer, pH 7.4 (1 mL). After centrifugation (9,000 ×g), the tumor necrosis factor-α (TNF-α) level in the supernatant was measured by enzyme-linked immunosorbent assay (ELISA), and the concentration is expressed as pg/μg protein. The processes were performed according to TNF-α kit manuscript (Cayman, Ann Arbor, MI, USA). After paraffin blocks were dewaxed and rehydrated with graded alcohol, these tissue sections were heated in pressure jars filled with 10 mM/L citrate buffer using microwave for 10 minutes. After that, slides were cooled in water for 15 minutes and then washed in phosphate buffered saline. The slides were incubated overnight with the primary antibody. The primary antibodies were specific rabbit polyclonal antibodies against COX-2 (Thermo), F4/80, and CD3 (Santa Cruz Biotechnology). Each antibody was diluted 1:100. After incubation, the subsequent reaction was formed using an Envision kit (DakoCytomation, Glostrup, Denmark). Finally, the slides were incubated with 3,3′-diaminobenzidine (DakoCytomation) and counter-stained with hematoxylin (Sigma). Number of antibody positive cells was determined in five fields of colon mucosa and submucosa area selected at random in each mouse and examined at ×40 and ×100 magnification. Values are given as mean±standard error of the mean (SEM). Rat intestinal epithelial cells (IEC-6) was obtained from the American Type Culture Collection (ATCC; Rockville, MD, USA) and maintained according to the ATCC’s instructions. IEC-6 cells were maintained in DMEM medium containing 10% fetal bovine serum (Hyclone; Thermo, Logan, UT, USA), and 1% penicillin/streptomycin at 37°C in a humidified atmosphere with 5% CO2. Cell viability was assessed using the 3-(4,5-dimethylthiazol-2-yl)-2,5-diphenyltetrazolium bromide (MTT) colorimetric assay. MTT was purchased from Sigma Chemical Co. (St. Louis, MO, USA). The filtrate (50 g) was mixed with water 1 L and then lyophilized. The cells were plated into 96-well plates at 104 cells/mL and allowed to adhere for 24 hours. AM and TH extract was applied in the test wells at various concentrations for 24 hours. Statistical analysis was carried out using SPSS version 17.0 (SPSS Inc., Chicago, IL, USA). Data (mean±SEM) from cell lines and animals were analyzed using Kruskal-Wallis tests and group comparisons were performed with Mann-Whitney U tests. Using animal model of 4% DSS-induced colitis as shown in protocol (Fig. 1A), 100 mg/kg AM (group 3), 100 mg/kg TH (group 4), 50 mg/kg AM+50 mg/kg TH (group 5), and 30 mg/kg sulfasalazine (group 6) were pretreated 2 weeks before DSS administration to evaluate the preventive effects of AM or TH. Four percent DSS administration provoked significant levels of colitis as manifested with reduced body weight (Fig. 1B) and clinical symptoms of hematochezia, diarrhea, animal activities, abdominal pain, and poor oral intake, and so forth (Fig. 1C). Mean body weights were significantly decreased only in DSS-induced colitis group 2 (p<0.05), but no significant decreases in body weight were noted on other group. DAI score included the severity of rectal bleeding, diarrhea and poor oral intake, which was measured every day after DSS administration (score from 0 to 5).18 DSS-administrated group had significantly increased DAI score compared with normal group 1 (p<0.001) (Fig. 1C). However, oral administration of AM and/or TH significantly improved the severity of rectal bleeding, diarrhea and poor oral intake (Fig. 1C). As seen in Fig. 1D, DSS administration significantly shortened colon length (p<0.001), but AM and/or TH pretreatment group showed significantly longer colon length than DSS control group (p<0.05). Significant finding was noted from that sulfasalazine treated group (group 6) that sulfasalazine was only effective in the change of body weight, whereas sulfasalazine neither decrease DAI nor prevented DSS-induced colon length shortening. According to pathological score, total pathological scores were made according to group. On the pathological findings as seen in Fig. 1E and Fig. 2A, 4% DSS administered in drinking water have induced significant levels of colon inflammations, extensive colon ulcerations as well as submucosal edema (p<0.001). However, these pathological scores were significantly decreased in group 3, group 4, and group 5 (p<0.05). On separate analysis of colon ulceration according to group, only group 3, group 4, and group 5 showed significantly decreased scores, whereas group 6 did not (p<0.01), signifying that AM and/or TH played significant preventive effects of colitis. In this setting, sulfasalazine showed inferior outcome compared to AM and/or TH in preventing DSS-induced colitis. Interestingly, sulfasalazine was found to be inferior to AM and/or TH on these pathological analyses (Fig. 1E). When pathological changes were scored according to inflammation, ulceration, and regeneration, respectively, group 3 and group 5 showed significant decreases in inflammation score (p<0.05), group 3, group 4, and group 5 showed significant decreases in colon ulceration (p<0.05) (Fig. 2A). AM and/or TH pretreatment imposed significant anti-inflammatory and antiulceration activities in colitis model, better than sulfasalazine in some pathogenesis of experimental colitis (Fig. 2A). On further detailed evaluation of colon inflammation and colon ulcer after DSS administration, AM and/or TH afforded significant decreases in either inflammation score or ulceration score (p<0.05) (Fig. 2A). Hence, COX-2 and iNOS are frequently overexpressed in IBD as well as colon cancer16,20–22 and inflammatory cytokines including IL-1β and IL-6 closely reflected disease activities of IBD,23,24 we have measured COX-2 mRNA and COX-2 expressions according to group. As shown in Fig. 2B and C, COX-2 mRNA was significantly decreased with the preadministration of AM, TH, and sulfasalazine (p<0.05). We repeated immunohistochemical staining with COX-2 antibody (Fig. 2C) and found COX-2 expressions of colon were significantly decreased with preadministration of AM, TH, and sulfasalazine in all pretreated group. As shown in Fig. 3A, DSS-administrated group displayed significantly elevated levels of iNOS mRNA and protein (p<0.001). Similar as in COX-2, pretreatment all led to significant inhibition of iNOS mRNA as well as protein (p<0.01). IL-1β and associated inflammasome is also known as important mediator in colitis. As noted in Fig. 3B, IL-1β mRNA was all significantly decreased with pretreatment of AM, TH, and sulfasalazine. Mucosal levels of colon TNF-α were measured by ELISA. As shown in Fig. 3C, TNF-α, one of core cytokines responsible for IBD, were significantly increased after 4% DSS administration (p<0.001), but pretreatment of AM and/or TH led to significant decreases in TNF-α (p<0.05), but sulfasalazine did not change TNF-α levels in colon. Since the sources of all of these mediators implicated in DSS-induced colitis are infiltrated monocytes such as lymphocytes and macrophages, we did do the immunohistochemical staining with F4/80 for macrophage and CD3 for T lymphocytes in DSS induced colitis (Fig. 4A). As observed, F4/80 and CD3 were all significantly increased in DSS administered control group (p<0.001), but the levels of F4/80 and CD3 were all significantly decreased with pretreatment of AM, TH, and sulfasalazine (p<0.05). Signal transducer and activator of transcription 3 (STAT3), activated via IL-6-gp130-JAK signaling, has a role of regulation of inflammation pathway such as iNOS expression and cyclin D1 expression when it is phosphorylated and bind to the promoter region of target gene.25–27 Nuclear factor (NF)-κB has been considered as transcription factor to regulate expression of COX-2 and iNOS.28 Activation of NF-κB was followed when the inhibitory subunit IκBα was dissociated, which requires phosphorylation of IκBα. The phosphorylation of IκBα-relased free NF-κB to translocated to the nucleus and regulate of transcription of target genes subsequently. MAPKs (mitogen-activated protein kinases) such as ERK (extracellular signal regulated kinase) were associated with activation of NF-κB.29,30 In this condition, NF-κB p65 and STAT3 expressions were all significantly increased after DSS administration (p<0.001), but pretreatment of TH and AT+TH significantly decreased NF-κB and STAT3 (p<0.05) (Fig. 4B). Sulfasalazine was inferior to AM and TH in repressing DSS-induced NF-κB as well as STAT3 inactivation. On serial measurement of ERK, JNK, and p38 (data not shown), we have found ERK played main signal transduction in DSS-induced colitis (Fig. 4C) and AM extract significantly inactivated ERK. Based on these elucidations, we have stimulated IEC-6 intestinal cells with lipopolysaccharide (LPS) and checked the changes of COX-2 and TNF-α mRNA to validate the findings from in vivo animal model. Before cell treatment, we have identified two backgrounds, one was to perform HPLC using AM or TH to depict different active component. As seen in Supplementary Fig. 1A, atractylenolide III was depicted from AM and luteolin glucoside from TH and extracts from AM or TH showed no significant cytotoxicity up to 8 μg/mL (Supplementary Fig. 1B). As seen in Fig. 4D and E, both AM (0.25 and 0.5 μg/mL) and or TH (0.025 and 0.05 μg/mL) significantly inhibited COX-2 and TNF-α mRNA. NF-κB p65 repression was prominent with 0.05 μg/mL, but STAT3 inactivation was prominent in 0.5 μg/mL AM (Fig. 4E). On detailed evaluation based on scoring system for regeneration, the scores for colon regeneration were significantly increased in AT, TH, but not sulfasalazine pretreated group (p<0.01) (Fig. 5A). As seen in the Supplementary Fig. 2, regenerated crypts were featured with dilated goblet cells and different sized colon crypts, but in order pattern. We have measured the levels of heme oxygenase-1 (HO-1) since these phase 2 enzymes had been acknowledged as antioxidative and regenerating activities. The antioxidative and antimutagenic actions by phytochemicals were well-acknowledged mechanisms against inflammation-based injury. As seen in Fig. 5B, TH alone (group 4) or combination of AM and TH (group 5) significantly increased HO-1 expressions compared to group 2 (p<0.01). In order to validate these findings, we have applied AT and TH extracts onto LPS-challenged cells. As seen in Fig. 5C, significantly HO-1 inducing action of AT and TH was observed. In the current study, we have found that AM and/or TH extracts were superior to current anti-inflammatory drug, sulfasalazine, in the preventing DSS-induced colitis, featured with potent anti-inflammatory, antioxidative, and regenerative mechanisms. Translating our findings into clinical implication, these edible and safe plant extracts, AM and/or TH, can be applied to prevent the relapse of IBD as supplementary agent during maintenance therapy. Though compared in animal models, we believe sulfasalazine, though currently acknowledged gold standard as maintenance therapeutics, was proven to be insufficient in preventing relapse due to lack in regenerating action such as HO-1. Before our study, it was reported that AM had anti-inflammatory activities in several studies2,4 and even tumor suppressive effect in various cancer treatment such as lung cancer, advanced colon cancer and brain glioma.5–7,31 Though not touched in the current study, significant STAT3 inactivation as well as NF-κB repression of AM can also be clue to the prevention of CAC, if we followed up colitis model for longer time. Since carcinogenic effect might be caused by chronic inflammation because inflammation caused mutation or instability of genome,28 the significant anti-inflammatory actions of AM and/or TH can exert both the preventive effect of IBD relapse and possibly prevention of CAC. Though there was no previous study explaining how AM anti-inflammatory effect, in this study, we found that COX-2, iNOS, TNF-α, NF-κB, pIκBα, p-STAT3 and ERK, mediators all reported to be intervened in colitis as well as CAC, were significantly regulated by AM and/or TH in both in vitro and in vivo models. The group pre-treated with AM or TH had low expression of COX-2 and iNOS accompanied by low expression of NF-κB, p-STAT3 and ERK, much better than sulfasalazine, a drug prescribed commonly. Li et al.3 reported the antioxidant action of Rhizoma AM through several scavenging and chelating experiments, but significant HO-1inducing actions were added from our study, warranting the prevention of colitis relapse. 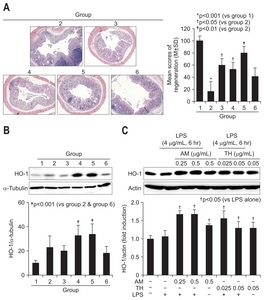 Multiple data showed anti-inflammatory activities of TH.12,32,33 Kim et al.34 suggested the TH inhibited expression of TNF-α by inhibiting IL-1 production and Seo et al.35 reported the protective effect of TH in acute pancreatitis in rats, concluding that TH can be potential agents to relieve inflammation. Regarding an antioxidative action of AM, there were several studies showing antioxidant activities of TH. For instances, Hagymási et al.36 determined an antioxidant effect on liver microsomes in rats. Hu and Kitts37 reported the antioxidant and anti-inflammatory effect of TH via the suppression of iNOS and COX-2 in vitro14 and the inhibitions of reactive oxygen species and nitric oxide.38 Since overproduction of reactive oxygen or nitrogen species can lead to tissue damage and vascular leakage, resulting in IBD and CAC,39 the antioxidantive and anti-inflammatory actions of TH can treat and protect IBD and inhibit subsequent CAC. 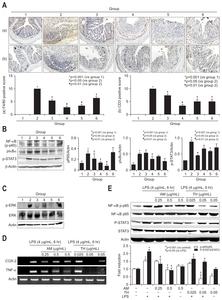 Recently, Jeong et al.40 demonstrated that AM significantly reduced production of the proinflammatory cytokines, TNF-α, IL-6 and prostaglandin E2 in LPS-stimulated RAW 264.7 murine macrophage cells and enhanced expression of HO-1 and prevented the generation of reactive oxygen species in RAW 264.7 murine macrophage cells. Zhang et al.41 showed that AM protected mice acute lung injury induced by LPS via inhibition of TLR4 expression and NF-κB activation. Zhang et al.42 also investigated that TM inhibited nitric oxide, prostaglandin E2, TNF-α, IL-1β and IL-6 production via NF-κB translocation in LPS-induced RAW 264.7 cells. The IBD, including ulcerative colitis and Crohn’s disease, is an idiopathic chronic inflammatory disease caused by oxidative stress, which often accompanies inflammation. It’s known that IBD is one of the major oxidative stress-overload diseases, whereby chronic inflammation results in neoplastic transformation and CAC.43 The results from our present study revealed that AM and TH rescued mice from DSS-induced colitis through inhibiting inflammatory mediators via inactivated ERK as well as repressed NF-κB and STAT3 and enhancing antioxidative activities via HO-1 induction. In summary, we found that planta extracts like AM and/or TH, based on potent anti-inflammatory and antioxidative effect as well as regeneration spurting action via HO-1 induction, significantly rescued from DSS-induced colitis. Thinking safety and efficacy, we concluded that these natural extracts can be potential candidate to treat IBD targeting to prevent relapse of IBD as supplementary intervention. However, further detailed clinical trials should be followed to put our phytoextracts as beneficiary relapse preventing strategy. This research was supported by National Center of Efficacy Evaluation for the Development of Health Products Targeting Digestive Disorders (NCEED). Fig. 1. A 4% dextran sulfate sodium (DSS)-induced colitis model and treatment efficacy according to group. (A) Study design: mice were pretreated with Atractylodes macrocephala (AM) or Taraxacum herba (TH) extracts and sulfasalazine 2 weeks before adding 4% DSS in their drinking water to induce colitis. Six-week-old male C57BL/6 mice from Charles River (Tokyo, Japan) were exposed to 4% DSS for 1 week; group 2 represents a disease control; group 3 was pretreated with 100 mg/kg AM before 4% DSS administration; group 4 was pretreated with 100 mg/kg TH before 4% DSS administration; group 5 was pretreated with 50 mg AM+50 mg/kg TH before 4% DSS administration; and group 6 was pretreated with 30 mg/kg sulfasalazine (SSZ) before 4% DSS administration (n=8). Drinking water and a pellet diet were provided ad libitum. (B) Body weight and (C) disease activity index (DAI) are shown according to group. AM or TH extracts significantly improved DAI and pathological symptoms associated with DSS-induced colitis in the mice. The DAI score was calculated as the sum of the scores of stool bleeding, diarrhea, retarded activity, abdominal pain, and poor oral intake and ranged from 0 to 5. (D) Colon length changes according to group. (E) Total pathological score according to group. The sum of the inflammation score and ulcer score ranged from 0 to 20. The mean scores of regeneration (mean±SD) ranged from 0 to 100. Fig. 2. Pathological score for inflammation and ulceration according to group and in relation to cyclooxygenase-2 (COX-2) changes. (A) Pathological colon sections stained with hematoxylin and eosin. Upper cross-sectional view and lower longitudinal sectional view (×40 magnification). Atractylodes macrocephala (AM) and Taraxacum herba (TH) extracts ameliorated the pathological status of inflammation and ulceration. (B) COX-2 mRNA and COX-2 levels according to group. Proteins obtained from colon tissue for the six groups were separated using sodium dodecyl sulfate polyacrylamide gel electrophoresis and immunoblotted using a specific COX-2 antibody, and real-time polymerase chain reaction was used to determine COX-2 mRNA levels. (C) Immunohistochemical staining of COX-2 according to group (×100 magnification). Fig. 3. Changes ininducible nitric oxide synthase (iNOS), interleukin 1β (IL-1β), and tumor necrosis factor α (TNF-α) levels according to group. (A) iNOS mRNA and iNOS levels according to group. Proteins obtained from colon tissue in the six groups were separated using sodium dodecyl sulfate polyacrylamide gel electrophoresis and immunoblotted using a specific iNOS antibody, and real-time polymerase chain reaction was used to determine iNOS mRNA levels. (B) IL-1β mRNA levels according to group. (C) Proteins obtained from colon tissue in the six groups were separated and measured using ELISA to determine the colon levels of TNF-α. Fig. 4. Immunohistochemical staining for F4/80 and CD3 in dextran sulfate sodium (DSS)-induced mouse colon mucosa and changes in nuclear factor (NF)-κB p65, IκBα, STAT3, and extracellular signal regulated kinase (ERK) levels in lipopolysaccharide (LPS)-challenged intestinal epithelial cells (IEC)-6 cells and mouse colon tissue. (A) Immunohistochemical staining with F4/80 (a, ×100) and CD3 (b, ×100). 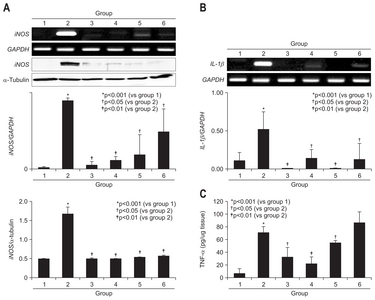 (B) The inhibition of NF-κB and antiphosphorylation effect on IκBα are shown for the Atractylodes macrocephala (AM) or Taraxacum herba (TH) pretreatment groups based on Western blot analysis. pSTAT3 was also measured, and the results are shown according to group. (C) ERK phosphorylation and ERK levels were measured by Western blot analysis. Significant inhibition of phosphorylated ERK was noted in groups 3 and 5. (D) Changes in cyclooxygenase-2 (COX-2) and tumor necrosis factor-α (TNF-α) mRNA levels in LPS-challenged IEC-6 cells according to dose (0.25 and 0.5 mg/mL AM and 0.025 and 0.05 mg/mL TH). (E) Changes in NF-κB p65 and signal transducer and activator of transcription 3 (STAT3) levels in LPS-challenged IEC-6 cells according to dose (0.25 and 0.5 mg/mL AM and 0.025 and 0.05 mg/mL TH). Expression of phosphorylated NF-κB p65 and phosphorylated STAT3 as measured by Western blot analysis. Fig. 5. Regeneration activities according to group and changes in antioxidative, regenerating heme oxygenase-1 (HO-1) expression. (A) Representative pathology according to group. Regenerative colon glands can be easily identified due to their irregularly shaped colon crypts and dense H&E staining (×40). The density of regenerated colon glands is reported according to group. (B) HO-1 expression according to group. HO-1 is significantly elevated in groups 4 and 5, which were pretreated with Taraxacum herba (TH). (C) HO-1 changes in lipopolysaccharide (LPS)-challenged intestinal epithelial cells (IEC)-6 cells according to dose (0.25 and 0.5 mg/mL Atractylodes macrocephala [AM] and 0.025 and 0.05 mg/mL TH). Western blot analysis of HO-1 expression. COX-2, cyclooxygenase-2; IL, interleukin; TNF, tumor necrosis factor; HO-1, heme oxygenase-1; GAPDH, glyceraldehyde 3-phosphate dehydrogenase. Liu, Y, Jia, Z, Dong, L, Wang, R, and Qiu, G (2008). A randomized pilot study of atractylenolide I on gastric cancer cachexia patients. Evid Based Complement Alternat Med. 5, 337-344. Dong, H, He, L, Huang, M, and Dong, Y (2008). Anti-inflammatory components isolated from Atractylodes macrocephala Koidz. Nat Prod Res. 22, 1418-1427. Li, X, Lin, J, and Han, W (2012). Antioxidant ability and mechanism of rhizoma Atractylodes macrocephala. Molecules. 17, 13457-13472. Li, CQ, He, LC, Dong, HY, and Jin, JQ (2007). Screening for the anti-inflammatory activity of fractions and compounds from Atractylodes macrocephala Koidz. J Ethnopharmacol. 114, 212-217. Li, X, Liu, F, Li, Z, Ye, N, Huang, C, and Yuan, X (2014). Atractylodes macrocephala polysaccharides induces mitochondrial-mediated apoptosis in glioma C6 cells. Int J Biol Macromol. 66, 108-212. Liu, H, Zhu, Y, and Zhang, T (2013). Anti-tumor effects of atractylenolide I isolated from Atractylodes macrocephala in human lung carcinoma cell lines. Molecules. 18, 13357-13368. Kang, TH, Bang, JY, Kim, MH, Kang, IC, Kim, HM, and Jeong, HJ (2011). Atractylenolide III, a sesquiterpenoid, induces apoptosis in human lung carcinoma A549 cells via mitochondria-mediated death pathway. Food Chem Toxicol. 49, 514-519. Song, HP, Li, RL, and Chen, X (2014). Atractylodes macrocephala Koidz promotes intestinal epithelial restitution via the polyamine: voltage-gated K+ channel pathway. J Ethnopharmacol. 152, 163-172. Ahmad, VU, Yasmeen, S, and Ali, Z (2000). Taraxacin, a new guaianolide from Taraxacum wallichii. J Nat Prod. 63, 1010-1011. Sigstedt, SC, Hooten, CJ, and Callewaert, MC (2008). Evaluation of aqueous extracts of Taraxacum officinale on growth and invasion of breast and prostate cancer cells. Int J Oncol. 32, 1085-1090. González-Castejón, M, Visioli, F, and Rodriguez-Casado, A (2012). Diverse biological activities of dandelion. Nutr Rev. 70, 534-547. Schütz, K, Carle, R, and Schieber, A (2006). Taraxacum: a review on its phytochemical and pharmacological profile. J Ethnopharmacol. 107, 313-323. Qian, L, Zhou, Y, Teng, Z, Du, CL, and Tian, C (2014). Preparation and antibacterial activity of oligosaccharides derived from dandelion. Int J Biol Macromol. 64, 392-394. Hu, C, and Kitts, DD (2004). Luteolin and luteolin-7-O-glucoside from dandelion flower suppress iNOS and COX-2 in RAW264.7 cells. Mol Cell Biochem. 265, 107-113. Kim, YH, Choo, SJ, Ryoo, IJ, Ahn, JS, and Yoo, ID (2011). Eudesmanolides from Taraxacum mongolicum and their inhibitory effects on the production of nitric oxide. Arch Pharm Res. 34, 37-41. Eberhart, CE, Coffey, RJ, Radhika, A, Giardiello, FM, Ferrenbach, S, and DuBois, RN (1994). Up-regulation of cyclooxygenase 2 gene expression in human colorectal adenomas and adenocarcinomas. Gastroenterology. 107, 1183-1188. Fujita, T, Matsui, M, and Takaku, K (1998). Size- and invasion-dependent increase in cyclooxygenase 2 levels in human colorectal carcinomas. Cancer Res. 58, 4823-4826.
Cooper, HS, Murthy, SN, Shah, RS, and Sedergran, DJ (1993). Clinicopathologic study of dextran sulfate sodium experimental murine colitis. Lab Invest. 69, 238-249. Cheon, JH, Kim, JS, Kim, JM, Kim, N, Jung, HC, and Song, IS (2006). Plant sterol guggulsterone inhibits nuclear factor-kappaB signaling in intestinal epithelial cells by blocking IkappaB kinase and ameliorates acute murine colitis. Inflamm Bowel Dis. 12, 1152-1161. Singer, II, Kawka, DW, Schloemann, S, Tessner, T, Riehl, T, and Stenson, WF (1998). Cyclooxygenase 2 is induced in colonic epithelial cells in inflammatory bowel disease. Gastroenterology. 115, 297-306. Cross, RK, and Wilson, KT (2003). Nitric oxide in inflammatory bowel disease. Inflamm Bowel Dis. 9, 179-189. Kankuri, E, Asmawi, MZ, Korpela, R, Vapaatalo, H, and Moilanen, E (1999). Induction of iNOS in a rat model of acute colitis. Inflammation. 23, 141-152. Nemetz, A, Nosti-Escanilla, MP, and Molnár, T (1999). IL1B gene polymorphisms influence the course and severity of inflammatory bowel disease. Immunogenetics. 49, 527-531. Mudter, J, and Neurath, MF (2007). Il-6 signaling in inflammatory bowel disease: pathophysiological role and clinical relevance. Inflamm Bowel Dis. 13, 1016-1023. Yu, Z, and Kone, BC (2004). The STAT3 DNA-binding domain mediates interaction with NF-kappaB p65 and inducible nitric oxide synthase transrepression in mesangial cells. J Am Soc Nephrol. 15, 585-591. Frank, DA (2007). STAT3 as a central mediator of neoplastic cellular transformation. Cancer Lett. 251, 199-210. Aggarwal, BB, Kunnumakkara, AB, and Harikumar, KB (2009). Signal transducer and activator of transcription-3, inflammation, and cancer: how intimate is the relationship?. Ann N Y Acad Sci. 1171, 59-76. Kundu, JK, and Surh, YJ (2008). Inflammation: gearing the journey to cancer. Mutat Res. 659, 15-30. Janssen-Heininger, YM, Poynter, ME, and Baeuerle, PA (2000). Recent advances towards understanding redox mechanisms in the activation of nuclear factor kappaB. Free Radic Biol Med. 28, 1317-1327. Schulze-Osthoff, K, Ferrari, D, Riehemann, K, and Wesselborg, S (1997). Regulation of NF-kappa B activation by MAP kinase cascades. Immunobiology. 198, 35-49. Chen, M, May, BH, Zhou, IW, Xue, CC, and Zhang, AL (2014). FOLFOX 4 combined with herbal medicine for advanced colorectal cancer: a systematic review. Phytother Res. 28, 976-991. Park, CM, Cho, CW, and Song, YS (2014). TOP 1 and 2, polysaccharides from Taraxacum officinale, inhibit NFkappaB-mediated inflammation and accelerate Nrf2-induced antioxidative potential through the modulation of PI3K-Akt signaling pathway in RAW 264.7 cells. Food Chem Toxicol. 66, 56-64. Kashiwada, Y, Takanaka, K, and Tsukada, H (2001). Sesquiterpene glucosides from anti-leukotriene B4 release fraction of Taraxacum officinale. J Asian Nat Prod Res. 3, 191-197. Kim, HM, Shin, HY, and Lim, KH (2000). Taraxacum officinale inhibits tumor necrosis factor-alpha production from rat astrocytes. Immunopharmacol Immunotoxicol. 22, 519-530. Seo, SW, Koo, HN, and An, HJ (2005). Taraxacum officinale protects against cholecystokinin-induced acute pancreatitis in rats. World J Gastroenterol. 11, 597-599. Hagymási, K, Blázovics, A, Fehér, J, Lugasi, A, Kristó, ST, and Kéry, A (2000). The in vitro effect of dandelions antioxidants on microsomal lipid peroxidation. Phytother Res. 14, 43-44. Hu, C, and Kitts, DD (2003). Antioxidant, prooxidant, and cytotoxic activities of solvent-fractionated dandelion (Taraxacum officinale) flower extracts in vitro. J Agric Food Chem. 51, 301-310. Hu, C, and Kitts, DD (2005). Dandelion (Taraxacum officinale) flower extract suppresses both reactive oxygen species and nitric oxide and prevents lipid oxidation in vitro. Phytomedicine. 12, 588-597. Darley-Usmar, V, Wiseman, H, and Halliwell, B (1995). Nitric oxide and oxygen radicals: a question of balance. FEBS Lett. 369, 131-135. Jeong, SJ, Kim, OS, Yoo, SR, Seo, CS, Kim, Y, and Shin, HK (2016). Anti-inflammatory and antioxidant activity of the traditional herbal formula Gwakhyangjeonggi-san via enhancement of heme oxygenase-1 expression in RAW264.7 macrophages. Mol Med Rep. 13, 4365-4371. Zhang, JL, Huang, WM, and Zeng, QY (2015). Atractylenolide I protects mice from lipopolysaccharide-induced acute lung injury. Eur J Pharmacol. 765, 94-99. Zhang, X, Xiong, H, and Liu, L (2012). Effects of taraxasterol on inflammatory responses in lipopolysaccharide-induced RAW 264.7 macrophages. J Ethnopharmacol. 141, 206-211. Yum, HW, Zhong, X, and Park, J (2013). Oligonol inhibits dextran sulfate sodium-induced colitis and colonic adenoma formation in mice. Antioxid Redox Signal. 19, 102-114. Saxena, A, Kaur, K, Hegde, S, Kalekhan, FM, Baliga, MS, and Fayad, R (2014). Dietary agents and phytochemicals in the prevention and treatment of experimental ulcerative colitis. J Tradit Complement Med. 4, 203-217. Somani, SJ, Modi, KP, Majumdar, AS, and Sadarani, BN (2015). Phytochemicals and their potential usefulness in inflammatory bowel disease. Phytother Res. 29, 339-350. Hur, SJ, Kang, SH, and Jung, HS (2012). Review of natural products actions on cytokines in inflammatory bowel disease. Nutr Res. 32, 801-816.